I think I've finally acclimated to these below freezing temperatures. I had been dreading getting back to business, standing outside sans coat but at 22 degrees on Saturday I didn't have any complaints. I wasn't freezing in the few minutes it took to document my outfit, which is funny because I recall a lot of shivering at 40 back in December. I didn't realize how cold it was until we were driving downtown and noticed how bundled everyone was, faces covered and all. I kept things simple with an icy winter palette of pale blue and off white paired with black pants and taupe boots borrowed from Mom. Happy Monday, I hope those of you who have the day off are enjoying your three day weekend! Just love this casual look. Loving that scarf! That scarf looks like the coziest thing ever! Great casual outfit! Love this look! It has been my winter uniform. I love the color palette. 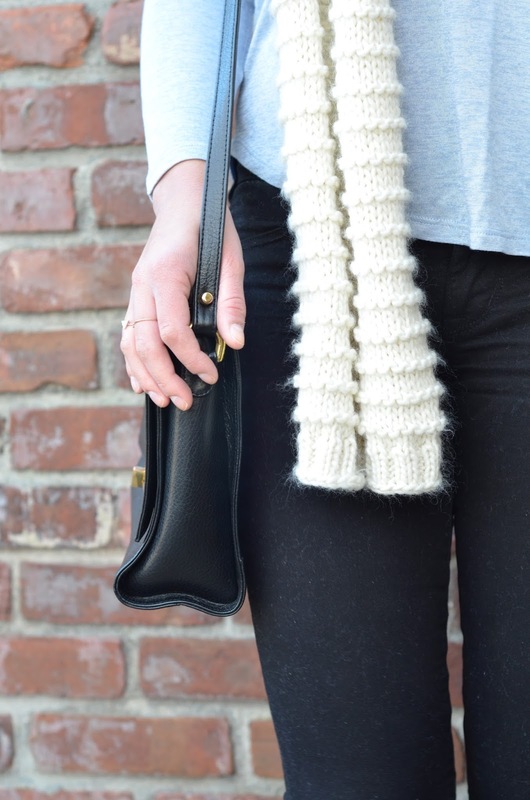 Perfect outfit for winter! Loving that scarf! Those pants look great on you! I feel the same way, I've been wandering out without hat/scarf/gloves lately because I've forgotten that it's cold. Love your new booties. Another great neutral. I know what you mean about Saturday's temps! It didn't feel that cold! 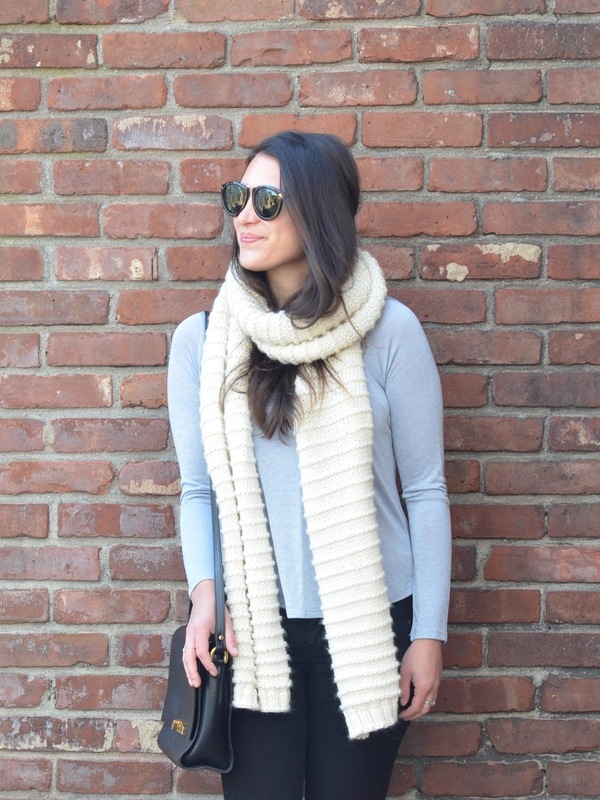 Love your light blue sweater and cozy scarf! Winter pastels are a breath of fresh air especially in NYC where we all wear black! Ugh same here! This weather is killing me! Love this whole look, the jeans, the sunnies, the purse! Love love it all! Great winter look! 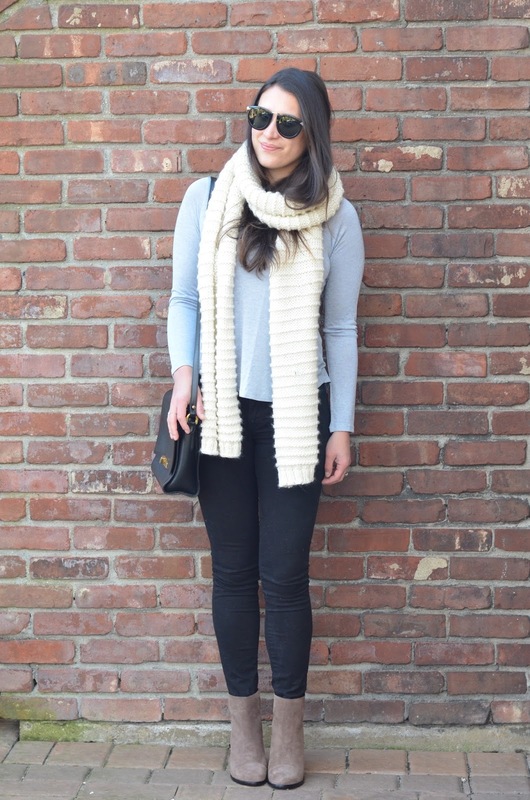 Love that scarf and the booties! 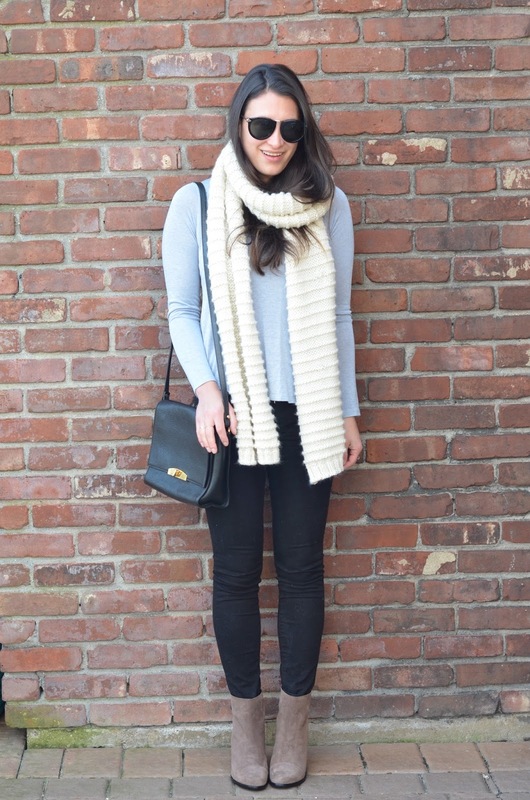 Love the booties and ice blue sweater!